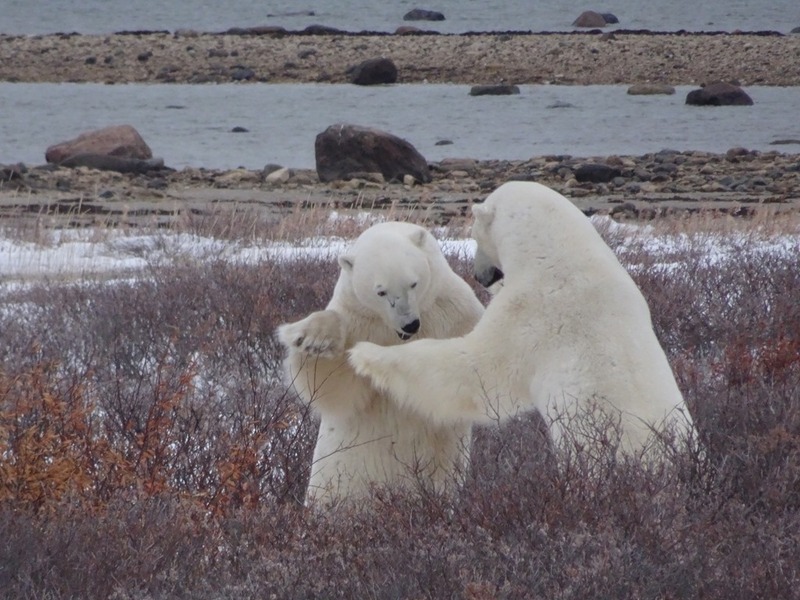 We came to Churchill Manitoba Canada on a tour to learn about and to see the world’s largest land predator—polar bears. 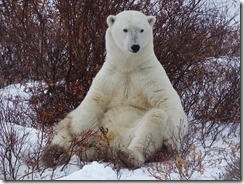 Polar bears evolved from brown bears about 200,000 years ago, to better accommodate to cold climates. These accommodations include larger size, white fur, higher fat diets and relatively smooth teeth designed for scraping blubber rather than the serrated teeth with which brown bears tear meat. But even with these differences, polar and brown bears do occasionally mate and produce offspring with varying properties of each species. 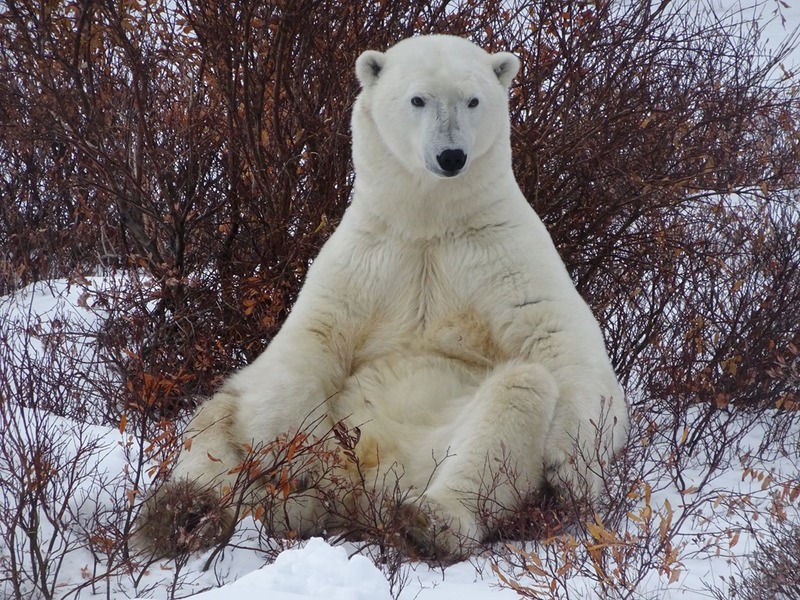 Male polar bears, which are considerably larger than females. They can growth to eight-to-ten feet in length and weigh up to 1,500 pounds. Females, by contrast, are more likely to be five to eight feet and 350-550 pounds. Even so, when a female feels the need to protect its cubs, males take care. All polar bears share the same type of thick waterproof fur and layer of blubber to keep them warm, even in frigid water where they can swim up to 60 miles without stopping for a rest. On land, however, they can overheat easily and must rest and release heat, as by exposing their stomachs, their armpits and their groins. Bears are generally quite solitary, and other than for the roughly two and a half years mothers spend raising and preparing their cubs for their own solitary life, adults typically get together only once each year. Other than for a few play fights, in which males test themselves, adults are only truly together during spring mating season. 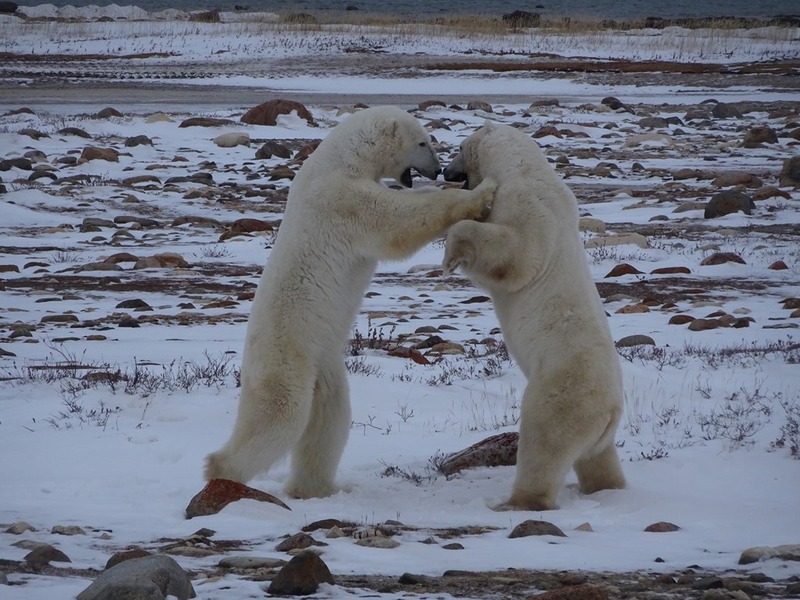 Males may fight each other—this time for real—to establish dominance and the right to mate with the female of their choosing. While most males survive these contests, a few may experience severe industries, such as a dislocated shoulder or a broken jaw which could jeopardize their chances to catch food and jeopardize their survival. The winners, meanwhile, win the opportunity to mate with the female of their choosing—a process that typically entails a couple weeks of courtship and actual mating, after which the two animals may never again see each other. Indeed, the male and female may repeat the process with another mate a few days later. Females, meanwhile, typically give birth to two cubs every three years and then spend the next about two and a half years teaching their cubs the requirements for feeding and surviving in the wild. Hopefully they won’t teach them dangerous and self-destructive habits, such as searching for unhealthy food in towns or in dumps. If they do, and are caught, they are sent to the Bear Jail in Churchill. Bears typically mate over a two-week period in April and May. This results not in immediate pregnancy, but in a process called “delayed implantation” in which the egg is not fertilized until September. By fall, between one and three embryos, depending on the bear’s health and fat level, will attaches to the female’s uterine wall. They then gorge on seals though June or July, at which time the ice melts and they go ashore. In August and September, females begin treks of between 15 and 100 kilometers inland, into Wapusk Park. They either return to an existing den or dig a new one out of soft peat. While she will typically have two cubs every three years, the number actually depends largely on the mother’s ability to carry and nurture her offspring. If, for example, the prospective mother is in poor health or lacks the fat needed to support herself or her cubs, one of both of the fertilized eggs won’t attach to her uterine wall. Cubs are typically born in late December and feed from their mother’s milk while the mother sleeps. 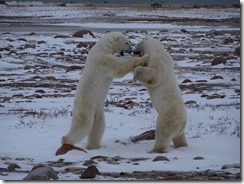 By January, the cubs have put on enough weight for the mother to take them out to the ice to learn to hunt. During this entire process, mama has not eaten much since her July feast. Fortunately, the bear’s favorite prey, ring seals are giving birth on the ice. This can provide relatively easy prey for the then emaciated mother and her cubs. This, however, assumes that they can catch and keep the seals from larger, more powerful competitors. Not surprisingly, only about half of all cubs survive the first year of their lives. By March, the easy pickings of newborn ring seals have gone. This forces the seals to adapt more challenging, and lower percentage hunting techniques (see Hunting Technique section below). The ice disappears by June or July. Now the newly fattened bears must return to the land, and are away from their source of food for the next six months. Unless they are lucky enough to happen upon a beached whale or other high-fat carcass, their metabolisms slow and they spend the rest of the year picking up low-value snacks, such as berries and kelp—anything they can find that requires little energy to find, eat or digest. Mothers, who give birth to and nurse their cubs though these lean months may lose up to half their weight over the summer. Others will lose a smaller percentage, perhaps 30 or 40 percent. The cubs, meanwhile, grow from about a pound at birth, to 25 to 30 by the time they leave the den. Seals are, by far, the bear’s preferred and most nutritious food source. They are particularly partial to ring seals which have a particularly high fat content. And since bears retain about 80 percent of the nutrition from the fat they eat compared with about 20 percent of the nutritional value that we humans capture from our food), it is also a highly efficient source of nutrition. Ring seals are also smaller (about 125-150 pounds), and are easier for the bears to pull from the sea than are other seals. Mature bears may well eat 35 or 40 of them per season, an amount required to carry them through the roughly five months per year in which they can’t catch seals. The easiest way to capture seals is to catch small, defenseless babies and their mothers. Although the bears have roughly human-level eyesight (although they can see much better underwater) and hearing, they have an extraordinarily acute sense of smell on which they rely to find food. They can detect the smell of a newly born seal from several kilometers away. They also have olfactory sensors in their tongues, which help them detect and identify food, such as kelp and seeds. When the seals return to the sea after the seal birthing season, the task becomes more challenging. Bears typically address this challenge in one of two ways. The most efficient, highest payoff means is generally to position themselves above the breathing holes that seals cut into the ice. When the seal surfaces through the hole for air, the bear pounces in hopes of snatching the seal onto the ice. If they can keep a larger bear from taking the seal for its own, here the bear can eat the fat-rich blubber, leaving the skin and the rest of the seal for animals lower on the food chain, such as artic foxes. 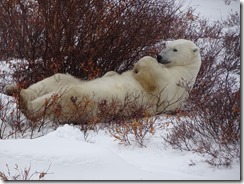 Other bears have devised other, albeit generally lower-payoff strategies, such as lying in wait near the edge of an ice flow. They wait for seals to leap up onto the ice to rest before returning to the sea. When a seal emerges, the bear, ideally from behind, crawls slowly toward the seal with the hope of catching it before it spots the bear and slips back into the sea. Outside ice season, pickings become much less scarce. 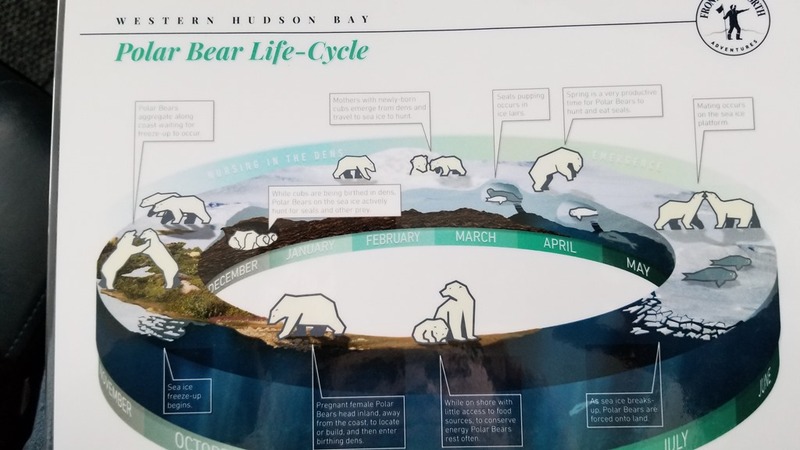 Unless the bear happens into a bonanza, such as finding a beached, dead whale on the shore, they have to rely on grazing for blueberries and kelp. It is true that their reduced metabolisms, slow movements and frequent rests require less nutrition, but the value they get from these other sources barely compensate for the energy they expend in finding, eating and digesting these alternate foods. Young cubs face huge challenges in capturing the seals they will require to survive to the next year. Since the larger, most dominant bears take the best sites, the cubs are relegated to less promising sites. Moreover, their hunting skills are less refined and they may lack the size required to pull seals from the sea or keep them from escaping. And even if they do manage to land their prey, they find it hard to prevent larger bears from stealing their hard-earned meal. Moreover, large males may sometimes kill male cubs—not necessarily to eat—but possibly to eliminate potential competitors for female mating partners. It is, therefore, little surprise than only about half of all cubs survive their first year—even with the help of their mothers. If the cubs are to survive, they must learn to be self-sufficient within about two and a half years they spend learning from their mothers. After this, the mother is otherwise occupied with spring mating and in fall, digging and preparing her den for the birth of new cubs. If the cub does survive these first couple years, the odds are that it will live a long, healthy life. Polar bears in the wild typically enjoy lifespans of 15 to 18 years and a recorded maximum of 30 to 35 (compared to average lives of mid-30s and maximums of 41 years in captivity). Annual mortality rates, in fact, are only five percent, with starvation being, by far, the leading cause of death.